Scott Langley Photography: "We are devastated"
I often find myself overwhelmed with the state of the world when I listen to the news. War, poverty, injustice. Most days, I turn on the news radio in my kitchen as background noise while simply going about my morning routine. I don't allow myself to truly absorb the information I am hearing, because it would just be too much to handle. But on one day this past September, one particular story hit me hard. So hard that I had to go sit in an empty room away from my family and just weep. Sobbing in a way I have not done so for a long time. The story was about Leon Brown and Henry McCollum, two brothers who were exonerated from death row and prison in North Carolina after spending 31 years wrongfully convicted for a murder they did not commit. The report on this particular morning was about the judgment by a court that the two men were each awarded $750,000 as compensation for their wrongful convictions. My immediate reaction was celebratory - after all, these men deserve this large sum of cash, and the state deserves to be held accountable for their miscarriage of justice. My feelings dramatically shifted when the news reporter interviewed a family member of Leon (who was speaking on his behalf since he was hospitalized at the time for mental illness treatment). Expecting the family member to also have a reaction of excitement, I was shocked when she said this: "We are devastated." That word. Devastated. It completely caught me off guard. In all my work with criminal justice issues, no interview had ever hit me so hard. Someone just handed the family $1.5 million dollars, and they are devastated? On the inside I knew exactly why. No amount of money could compensate or atone for what Leon and Henry went through. The family member being interviewed went on to say that “Leon was destroyed. … He will never be right again.” His hospitalization was the ninth time he had been in treatment since his release - just one year prior. If there is one thing you can say about the death penalty, it is that it brutalizes us all. It literally devastates families - on all sides of the issue, prisoners and victims alike. It puts innocent people in prison, and we know innocent people have been executed. I stood outside a prison in Georgia in 2011 when it happened to Troy Davis. I have seen up close and personal, as a photojournalist and an advocate, how the system is devastating families on a regular basis. 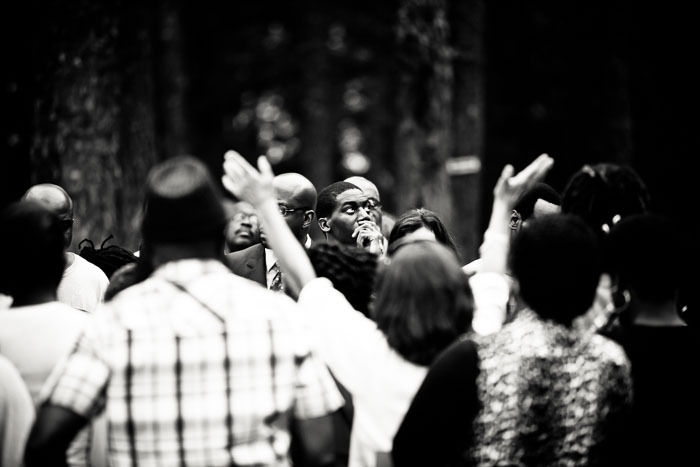 De'Juan Davis Correia, the nephew of Troy Davis, outside the prison in Georgia just before his uncle's execution in 2011. 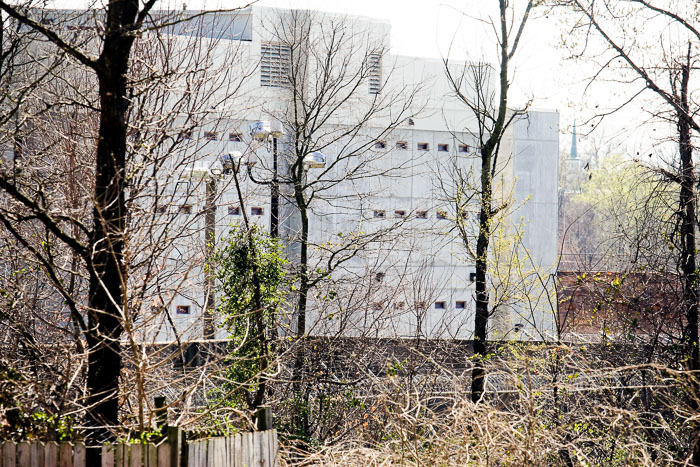 156 men and women have been exonerated from death row since 1973. Most of them did not receive even a penny, let alone an apology, from the state. Some of them are speaking out against the system and contributing to positive change. Some of them are in and out of mental hospitals. Some of them are just making do. And some of them have committed suicide. 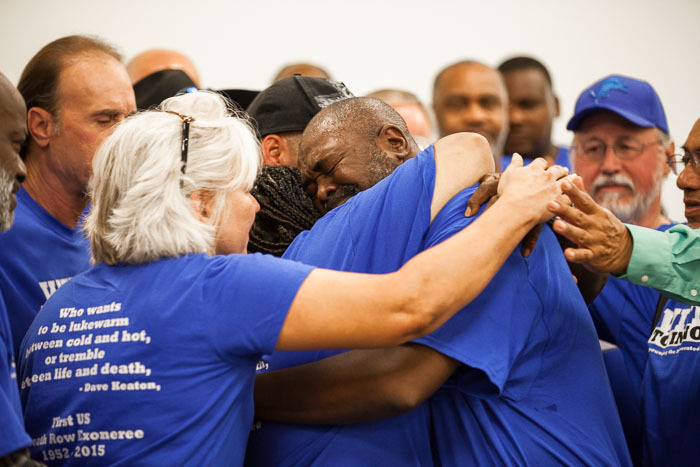 Whatever the outcome post-exoneration, we know that these men and women will never be the same. And no amount of money can fix the harm that has, and will be, done. In October 2015, I walked for three days of a seven day, 83-mile march across Ohio with a group of dedicated death penalty abolitionists. We marched from the death house in Lucasville to the state capitol in Columbus. 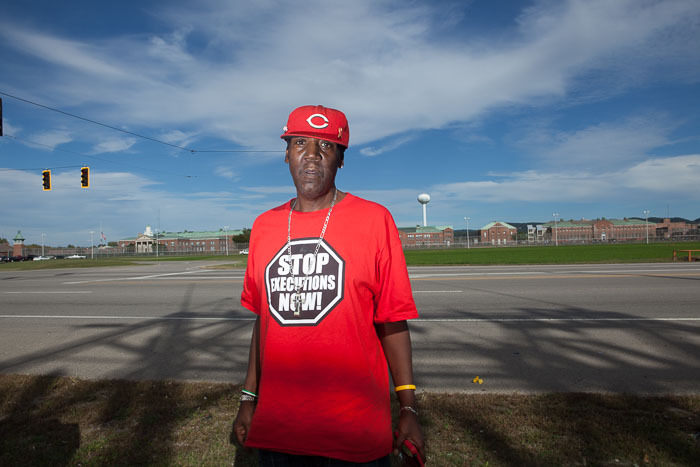 Among the walkers was Derrick Jamison, who spent nearly 20 years on death row in Ohio for a murder he did not commit. I had the chance to walk and talk with this strong, gentle soul for those three days and 45-miles. I heard both the sorrows of prison, and the joys of freedom. When we passed by the men's death row in Chillicothe, I stood with Derrick outside the prison, taking his photo with the prison as a backdrop. With that prison experience behind him, his feet are taking him forward. And his spirit carried us all forward in this march for justice. Derrick and I cut the walk short to head to Cleveland to attend a press conference for Witness to Innocence, where 25 other exonerees and their families were gathered. Among those who spoke at the press conference was Kwame Ajamu, who, starting at the age of 17, spent 27 years in Ohio's prisons (including some of them on death row) for a murder he did not commit. As I stood there photographing Kwame giving his statement to the press, I recalled that morning in my kitchen, just a month earlier, listening to that heart wrenching statement from the family member about how a wrongful conviction devastated the entire family. As I was reliving those emotions myself, I witnessed Kwame, a grown black man, break down in tears in front of everybody - family, friends, and the press. He was soon surrounded by the other exonerees who hugged him and consoled him. 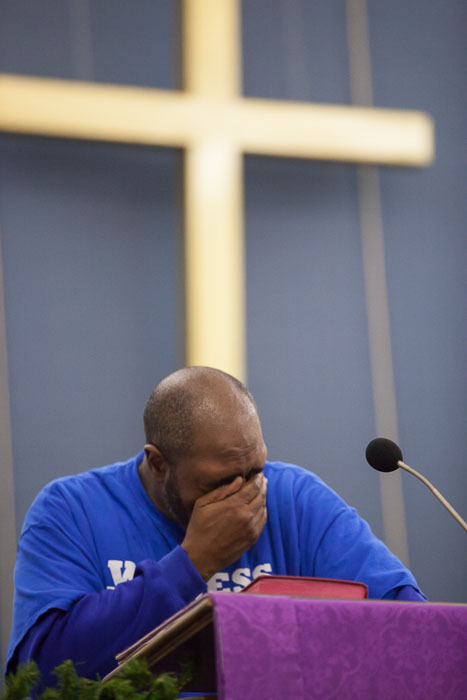 Kwame Ajamu, comforted by other death row exonerees at a Cleveland press conference in October 2015. Someone later remarked how rare it is for men in the African American community to cry - especially publically. 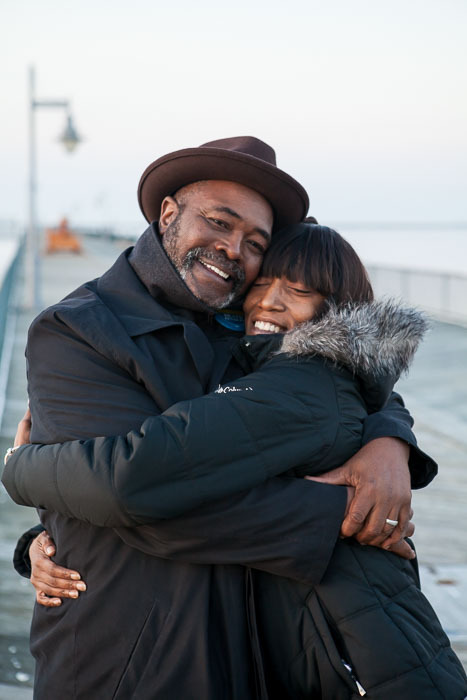 As I have experienced with Kwame and other exonerees I hear speak regularly, crying every time they tell their story is not abnormal. The experience retold is always fresh. Always raw. The pain of what Kwame went through, along with his brother who wrongfully spent 39 years in prison for the same crime, is so deep and intense that he has no other option but to weep. Two months later I was with Kwame on the one-year anniversary of his exoneration by the State of Ohio. He spoke that day at a church near Wilmington, Delaware. I sat in the audience, taking photos from afar, and as I scanned the room, I noted the ironies before us. Here was this black, Muslim man, speaking in a white, Christian church. Kwame was flanked on one side by a huge golden cross - the universal symbol for wrongful execution - and on the other, the United States' flag - for many, a symbol of injustice, violence and oppression. How strange to have all these symbols and realities laid out in such clear imagery. 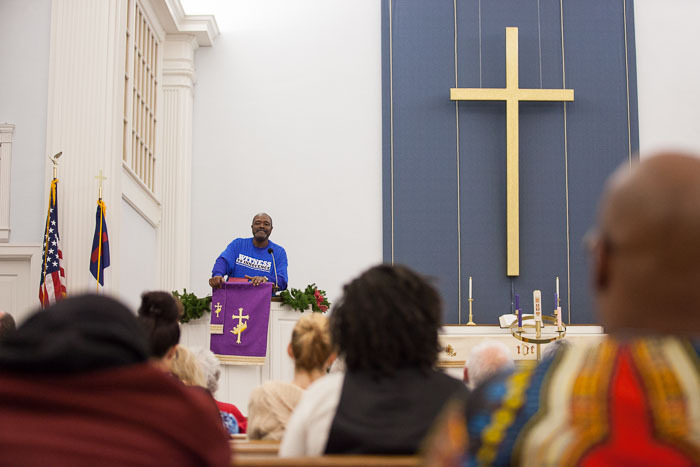 Kwame speaking at a church outside of Wilmington, Delaware on the one-year anniversary of his exoneration. In between speaking engagements for Kwame, we had brunch one day at a friend's home. 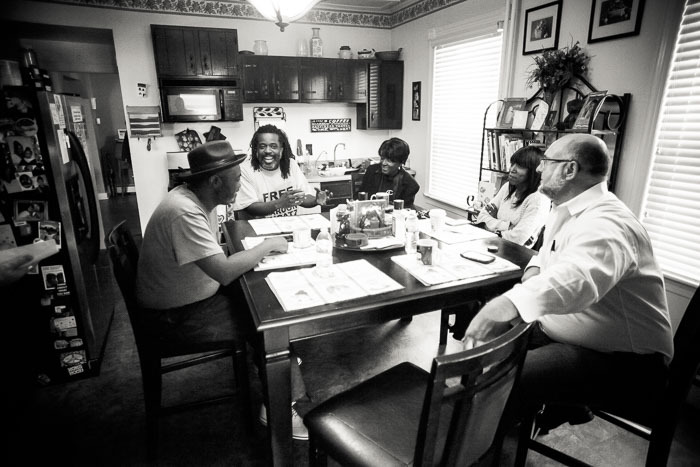 Gathered around the table was not just Kwame and his story, but a man whose father is a Black Panther serving a life sentence in prison, a mother whose son is currently in prison, and a woman whose brother was murdered by a relative of a police officer who was never charged or convicted. The men and women sitting around the table with these heartbreaking stories are all people of color, living in this broken society. And their stories are, sadly, not unique. This is our America. Kwame (left) sharing a brunch with other prisoner families and victim families. This is our reality as a nation. Our country, and especially our criminal justice system, is in desperate need of repair. In this desperation, we are witness to much devastation of not only the innocent, but all of us who are complicit as our government acts in our names. The first step we can take is to end the death penalty, because there is no place for something so final in a system that obviously cannot get it right the first time. It is then, and only then, that we can begin a true journey as a society to make sure we find a better way. 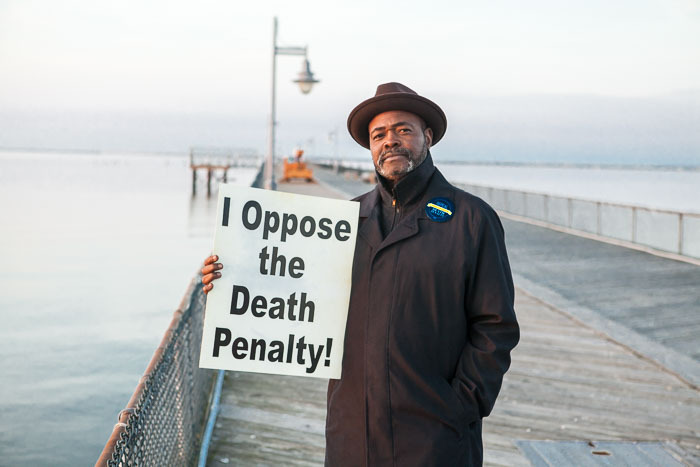 Kwame Ajamu, participating in the "I Oppose the Death Penalty" sign project. 26 other exonerees have held this same sign. For more photos of Kwame's visit to Delaware in December 2015, visit the full photo gallery. "OUR MINDS OF REASONING SHOULD NOT BE WASTED BY A LACK OF LOVE & UNDERSTANDING - SEEK FOR ANSWERS IN LIVING NOT KILLING"
"DEATH PENALTY BY LAW - IS UNJUST AND UNWORTHY - BY REFLECTIONS OF IRREVERSIBLE HUMAN ERROR"